The Psalms express the most elemental human emotions, representing situations in which people are most vulnerable, ecstatic, or driven to the extremities of life and faith. Many people may be familiar with a few Psalms, or sing them as part of worship. Here highly respected author Walter Brueggemann offers readers an additional use for the Psalms: as scripted prayers we perform to help us reveal ourselves to God. Brueggemann explores the rich historical, literary, theological, and spiritual content of the Psalms while focusing on various themes such as praise, lament, violence, and wisdom. He skillfully describes Israel's expression of faith as sung through the Psalms, situates the Psalmic liturgical tradition in its ancient context, and encourages contemporary readers to continue to perform them as part of their own worship experiences. Brueggemann's masterful take on the Psalms as prayers will help readers to unveil their hopes and fears before God and, in turn, feel God's grace unveiled to them. Click here to read the Table of Contents and Chapter 1. "This volume represents the splendid culmination of Walter BrueggemannÆs faithful, fruitful, career-long engagement with the Psalms—nearly one hundred books, articles, and book reviews over a period of almost fifty years! This crowning achievement will certainly be of major interest and usefulness to other scholars and teachers of the Bible. But my fervent hope is that it will also be widely used by pastors, musicians, and church educators so that Brueggemann's expressed 'long-term hope' for this volume will be realized—that is, 'that it may lead common church practice to greatly expand the repertoire of Psalms that are utilized in worship' (p. xi)." 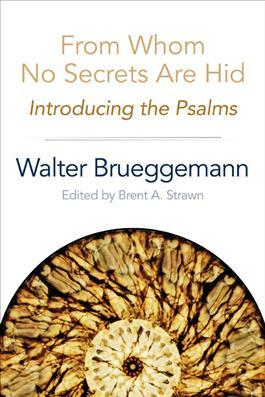 "While clearly a comprehensive introduction to the Psalms, Brueggemann's presentation is carried less by technical information about types, settings, and other such matters and more by beautiful expositions of individual psalms. The result is an entry into the Psalter that is available to all levels of students and others interested in understanding the Psalms and their significance for Christian faith." "Walter Brueggemann is the master interpreter of the Psalms, always in conversation with a wide range of scholarly issues and always with an eye to the context of contemporary readers. From Whom No Secrets Are Hid gives attention to difficult and often-unfamiliar texts in the Psalter as a means of revealing the self to the God who embraces pain and makes possible genuine newness. The articulation of the world envisioned in the Psalms and its challenge to our world in chapter 2 of the book are alone worth the price of the book! This volume will be lively and provocative for serious readers of the Psalms who seek growth in faith and for those who proclaim and minister in the powerful tradition of the Psalter."